The SMS for the birthday between husband and wife can be the key to detect the future of the marriage. Some couples forget about how important it is when the beloved person got born and they just offer a nice hold or even sometimes just some simple words to congratulate him or her on that special date. During the first years of marriage you surely remember how special the birthdays with your couple used to be, he or she used to offer a nice detail like: a romantic dinner, a poem, a song, a present and of course some really nice words to congratulate that beloved person. With the time, the romantic details have been disappearing on the marriage. However, the birthday of the husband or wife cannot be taken as a regular day even if you already celebrated so many parties with your couple. That day we must do everything we can to make the beloved person feel really special. There is nothing more beautiful, besides a kiss and a huge of course, than some nice words as proof of the love you feel inside your heart. 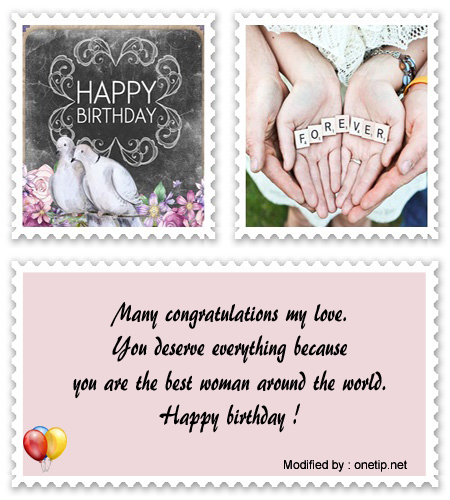 This message or greeting for the birthday of the husband or wife can be transmitted through many ways, it can be with a little card over the bed, in the mirror or maybe placed on the refrigerator, with a text message or even with an e-mail. If you want the flame of love to keep alive, you must at least celebrate the birthday of your husband or wife like a party never seen before. In other words it must not be taken as a regular day. Next we will show you some cool sms to express the love you feel for your husband or wife on either her or his birthday. :: Many congratulations my love. You deserve everything because you are the best woman around the world. Happy birthday. :: Happy birthday my love. I just want you to know that I will be by your side forever and ever. :: Because you are the love of my life. Happy birthday. :: I want to give you the best gift: mycown heart. Happy birthday my love. :: I only ask God to let me be with you many years to celebrate like this day. Happy birthday. :: Thanks for being so special for me. 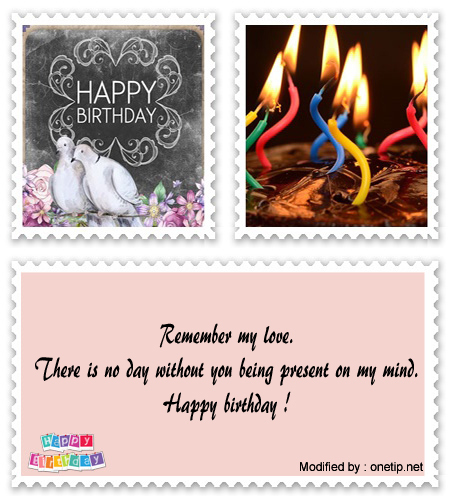 My best wishes for you on your birthday my love. Happy birthday. :: I want to be with you today and forever. Happy birthday. :: Happy birthday my love. The good Lord will bless you on this special day. :: God bless you today, tomorrow and forever. Happy birthday. 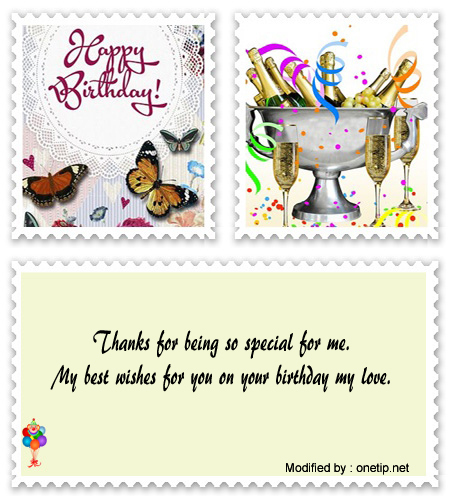 :: Thanks for sharing this special day with me, but I really appreciate the love you share with me. Happy birthday. :: Because I loved you since the first time I saw you, today and forever, I wish all your dreams come true. Happy birthday my love. :: On this special day for the both of us, I ask God to allow me the pleasure of being with you forever and ever. Happy birthday my dear love. :: Loving and holding you make me feel so happy deep inside. I hope you have a great birthday party baby. Happy birthday. :: God bless you and give you a nice moment with your family, friend but especially with me. Happy birthday my dear love. :: Because you are the man I was waiting for during my whole life. Happy birthday. :: Today on your birthday my dear husband I want you to know that I feel the luckiest woman in the entire world when I am by your side. Happy birthday. :: Thanks for showing me to love with passion. Happy birthday. :: Discovering the meaning of love by your side makes me feel the happiest woman. Happy birthday my dear husband. :: I hope God will allow me to be with you the whole life. 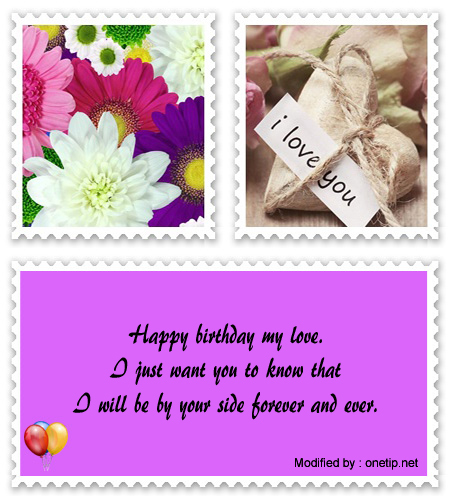 Happy birthday, this is the honest wish of a woman who cannot live without you. :: To my eternal love. Happy birthday my dear. :: Because you are a good man, a good husband and a good father. I hope with all my heart you have a good day. Happy birthday my dear husband. :: Happy birthday my love. Because I never imagine I would love someone so badly. Today I want you to be really happy. I love you. 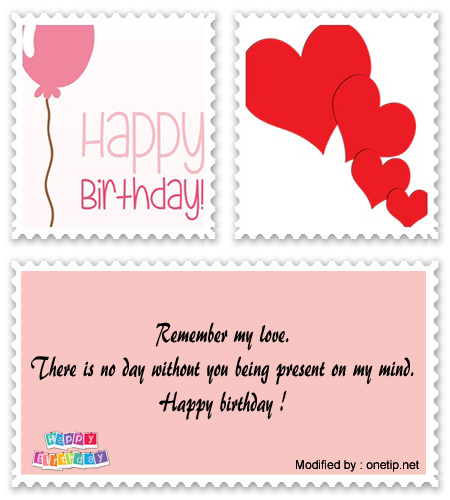 :: Although we cannot be together right now, I wish you happiness and I hope your wishes come true. Happy birthday my dear husband. :: You are the woman I dreamed about every night. Happy birthday. :: I thank God for giving me a wonderful wife like you. Happy birthday my dear wife. :: My beloved wife, thanks for showing me the true meaning of the love. Happy birthday. :: Thanks for being the best wife around the entire world. Thanks for gave me those wonderful kids. Happy birthday. :: God bless you my wonderful wife. Happy birthday. :: Because you are the only one who won my heart. Happy birthday. :: To a great woman, a great mother and a wonderful wife. My best wishes. Happy birthday. :: To the cutest and prettiest wife around the whole world. Happy birthday. :: Because I would never love anybody the way I love you woman. Happy birthday. The birthday messages written on this essay can be absolutely a great help for the husband or maybe the wife who want to express the feeling from the bottom of the heart. The most important thing is that you have to pick the right messages and of course mean it like never before. 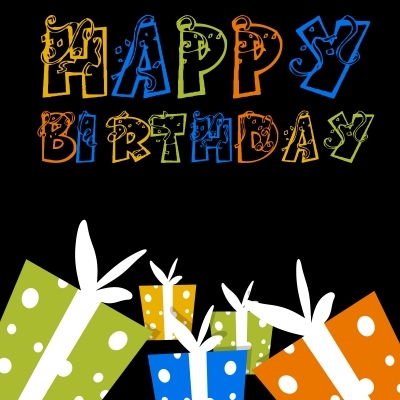 Send your cutest birthday message and will be published , other friends wil thank you .